I’ve been neglecting my blog lately. But I have some good excuses. And this is one of them. 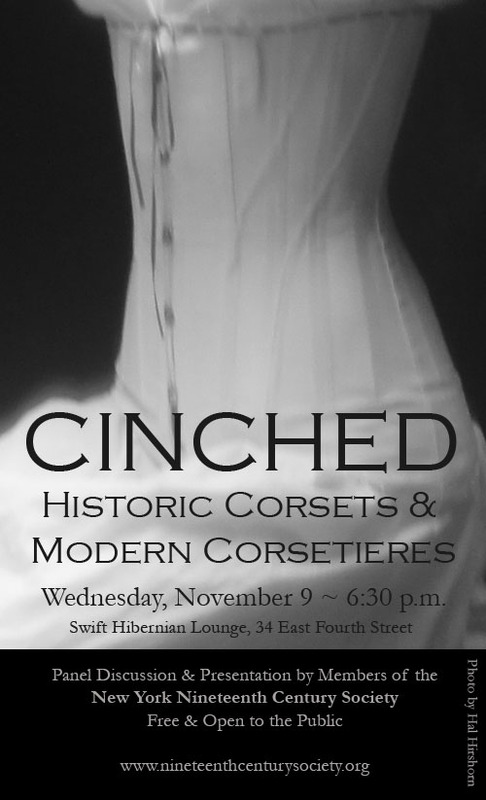 On Wednesday, November 9, I took part in CINCHED: Historic Corsets & Modern Corsetieres. It was a production of the New York Nineteenth Century Society, with six corset makers, one master of ceremonies, one very efficient organizer, and an audience of more than 60 delightful (and hopefully delighted) onlookers. We each took turns, in chronological order from 18th through early 20th centuries, describing corsets that we’d made and detailing their historical backgrounds. In addition to helping organize the event, held at Swift Hibernian Lounge (our favorite local bar), I also hand sewed a nearly perfect version of the 1855/57 corset. In purple silk!! Okay, I know purple silk isn’t historically accurate. Though I did find a very similar mid-century corset in white silk. I just couldn’t resist that purple. And it was wonderful to work with after six versions made from canvas duck. The fit is getting so close. In fact, I think I may have cracked the code with a new shape in the side seam — more on that later. For now, it just needs a few tweaks (mostly adding the extra half inch I shaved from the hip at the side seam into the stomach gore) and it will be a very wearable garment. I guess the back needs a little work too, smoothing the remaining puckers. But it’s still close. Best part about wearing this at the event? One of the other corsetieres, and a professional designer, gave me some tips on making the gores fit better! And yes, that’s me, parading around in my underwear in a bar. Again. Photographs courtesy of Nidal Nasr, who generously volunteered his time and talent to document the event. Zoh and I are organizing a corset-making panel, with eight costumers, scholars, and designers each presenting one or two corsets. Most are historic reproductions, though there are also a few modern pieces, inspired by the rich history of the corset. We’re going to run it like an open mic, with Zoh playing emcee. Each presenter will show off their handiwork, talking about their research, inspiration, and construction. I just bought a 5-minute hourglass timer for the event — pun definitely intended. 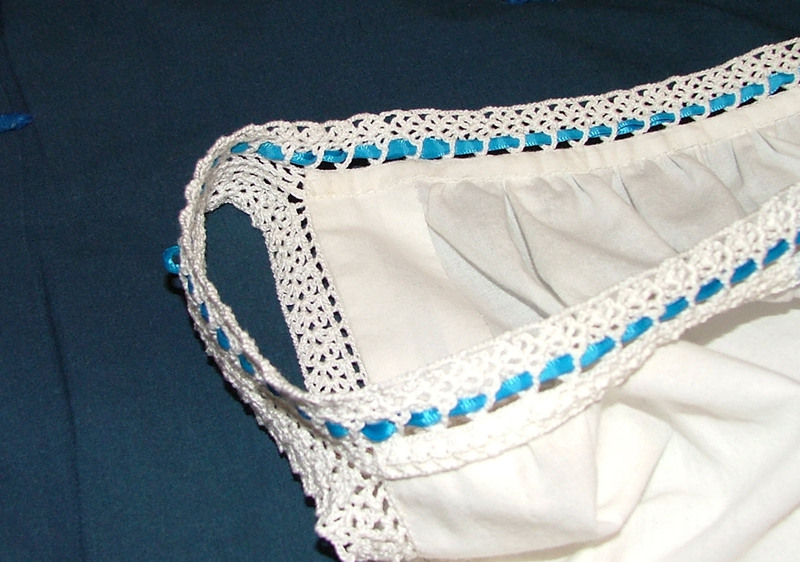 We’ll also be demonstrating the corsets, helping one another to lace. Afterwards, there will be time for the audience to meet the corsetieres and ask their advice on corset making. And of course, all this in an East Village bar! Yesterday afternoon, eight ladies and two gentlemen gathered in the basement of the Ottendorfer Library under the auspices of the New York Nineteenth Century Society to learn about crocheted lace. I was drafted to deliver the opening remarks, since I’ve been reading about crochet lately, thanks to my petticoat obsession project. After my little speech, complete with a few gems culled straight from period sources (stay tuned for a full article on early crochet as soon as I get the time to put it together), everyone whipped out their hooks. We began making samples from the triangular looped 1855 pattern I found in Peterson’s and used for my recently completed petticoat. Luckily, everyone there already knew how to crochet. I was just leading them a bit further down the primrose path to needlework insanity. They caught on quickly, producing impressive headers for their samples, and even getting so far as the first row of loops. 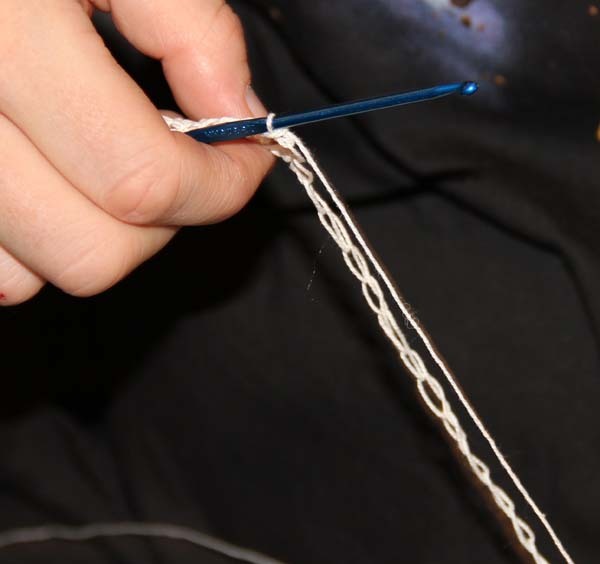 The photo above shows one of our talented hand-work circle members in mid-double-crochet. Here’s an audio excerpt from the introduction I gave. Before you listen, a couple of possible errata. 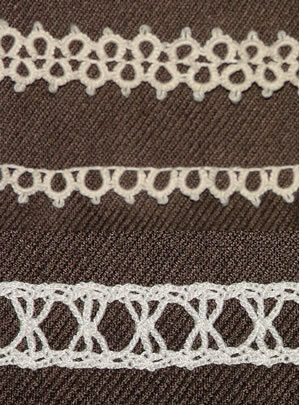 I call point lace an embroidered lace, but I think it would be more accurately termed a needle lace. Also, I say that Peterson’s is searchable on ProQuest. I don’t believe it is…but there is another major database that many research libraries do carry with Peterson’s, if I could only remember which one! After I finished my little speech, everyone set to work. I wandered around helping as needed, and working on my own petticoat trim. To make it more portable, I wrapped it around my neck (as captured in this photograph by my handsome and talented father, who was in attendance). The September meeting of the New York Nineteenth Century Society is tonight, and we are each tasked with bringing something representative of our heritage. Most of my family has been in America for too long to have any colorful folk costumes, so I decided to bring something edible. At first I was leaning towards my great-great-grandmother’s Scotch shortbread, but I’ve never made it before. I finally chose Shoo-Fly Cupcakes, from my Pennsylvania Dutch great-grandmother, Carrie Dougherty, née Yonker. Flavored with molasses and topped with butter crumbs, these moist little cakes are a perfect fall treat. My mother used to make them every year after we went apple picking, to go with steaming bowls of homemade spiced applesauce. Shoo-Fly Pie is a Pennsylvania Dutch tradition. Many people think of Shoo-Fly as a gooey, molasses flavored pie filling. But our family has always made the cake version. Like many Pennsylvania Dutch treats, it uses simple, cheap ingredients to create a surprisingly sinful taste. Here’s our top-secret family recipe. Sift flour and sugar together. Rub in butter until it’s fine and crumbly. Reserved 1 cup of crumb mixture for topping. Dissolve cream of tartar and baking soda in cold water. Mix water and molasses into flour crumb mixture. Stir until blended. 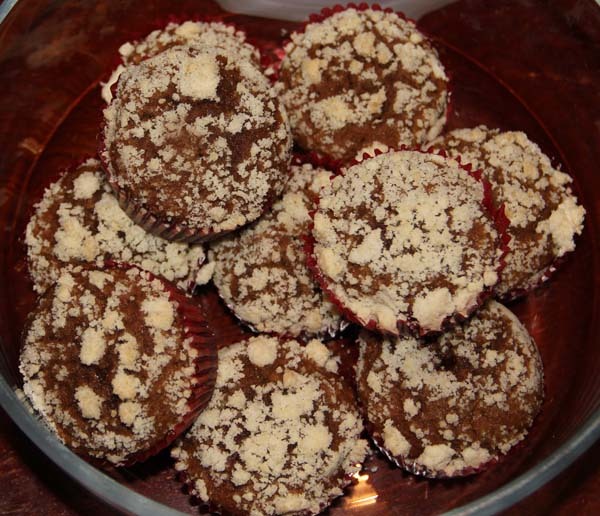 Fill muffin tins and sprinkle with reserved topping. Bake at 350 degrees for 20-25 minutes, or until just done. Don’t over bake, or they will be dry. Makes 24 cupcakes. 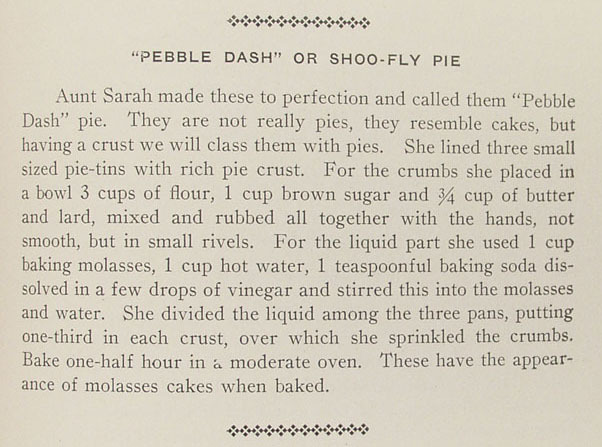 Actually, I guess Carrie Yonker’s Shoo-Fly recipe goes back just as far — if not further. She was already married and a mother by 1915. I’m going to share my recent obsession for mid-19th century crochet edgings next month at our first fall meeting of the New York Nineteenth Century Society Hand-Work Circle. I hope you’ll plan to be there! 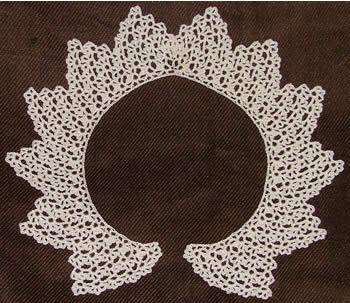 Saturday, October 1, 1 to 3 p.m.
Join the New York Nineteenth Century Society’s Hand-Work Circle for a presentation featuring techniques for recreating crocheted lace from historic patterns. Afterwards, you’re invited to hone your own crochet skills (please bring a spool of crochet thread — not yarn — and an appropriately sized hook), or simply sit back and enjoy the company of fellow enthusiasts while you work on your latest hand-work project. Free, but space is limited. RSVP to eva@nineteenthcenturysociety.org. Use of library space by the New York Nineteenth Century Society for this program does not indicate endorsement by The New York Public Library. So far, I’ve just got the header done, and have begun adding the central motifs, spaced along the length every couple inches or so. I really enjoy adapting crochet patterns from the past. It helps so much when there’s a picture to go along with the written directions, since so much is up for interpretation in crochet. I also like the way crochet can be used to imitate other styles of lace — that’s partly the reason crochet caught on in the first half of the 19th century. We’ll discuss the history of crochet, as well as techniques for finding and using historic patterns, at the upcoming Hand-Work Circle. This is the neck and sleeve of a chemise, made to be worn under an 1870s ballgown. I made up the pattern myself, based on a picture in Weldon’s Practical Needlework. I was in too much of a hurry to work through the pattern properly! Ignore the top two, they’re both tatted (and very poorly). The bottom one is a crocheted insertion, from a modern pattern. A completely apocryphal crocheted collar — just a bunch of repeats of a mid-20th century edging. Still, it’s rather pretty, and would look well on a dress…if I ever actually finished one, that is! Once I finish my current crochet trim, I think I’d like to try something with really fine thread. I have a set of teeny weeny hooks, imported from Germany, that don’t get nearly enough use. My size 10 steel hook (just about perfect for bedspread-weight cotton thread, which Peterson’s says is right for a petticoat) has seen so much activity lately, it’s changed color where my fingers go and started to bend at the top!